#TFEL is one giant ball of stress. Sometimes…you just need a smile or quick laugh. Check back daily for your dose of #TFELSmile. I’m a huge Ernest Hemingway fan (and if you don’t know who that is – God help you – and here is a quick bio). This blog post had me laughing for 5 minutes straight. 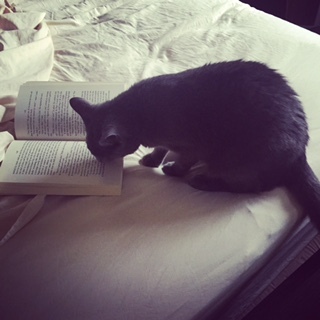 So much so that I took one of my cat Sheila reading A Moveable Feast. Who has time for shopping?